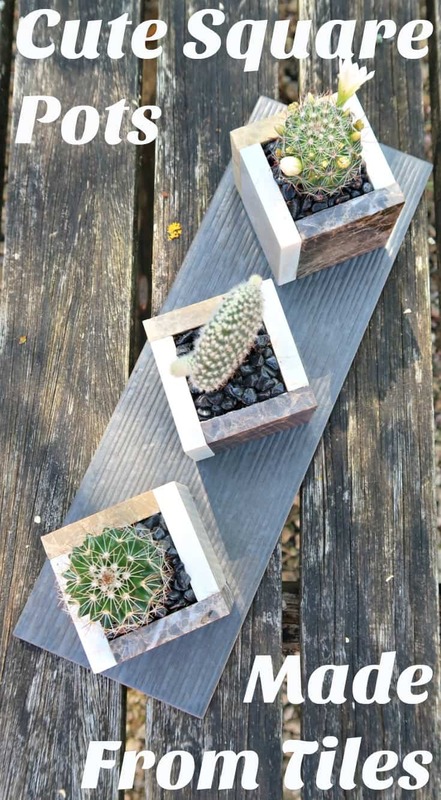 Square pots made from ceramic tiles are perfect for displaying mini cactus plants and other succulents. In this tutorial, we show you how to make a stylish window sill planter to display your miniature plants. Disclosure: I am delighted to be working with Bostik as a Bostik Blogger. Each month the Bostik Bloggers create a craft that our readers can easily re-create at home. 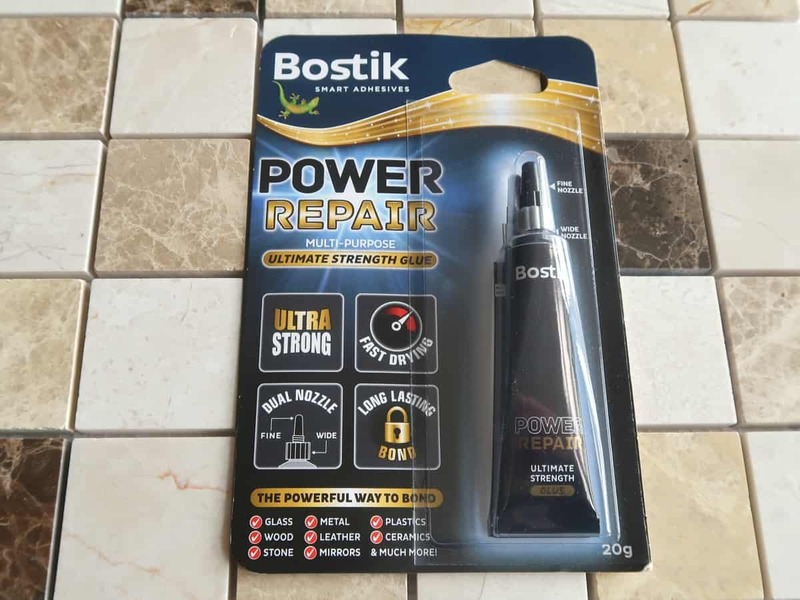 This month I am trying out Bostik Power Repair Ultimate Strength Glue. 1 Rectangular Ceramic tile for the base. What is Power Repair Ultimate Strength Glue? 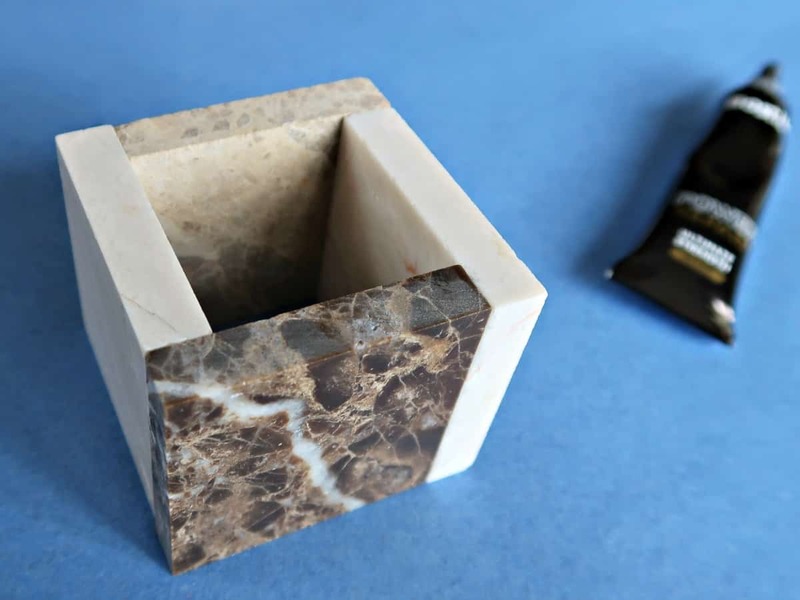 Bostik Power Repair is an ultra strong, fast drying glue that provides a long-lasting bond and is suitable for use on a wide range of materials including glass, stone, wood, metal, leather and plastics. It can be used in extreme temperatures and is waterproof, making it suitable for outside projects as well as indoors. Bostik Power Repair is simpler to use than many other types of strong glue. It is solvent and odour free, making it safe to use anywhere. 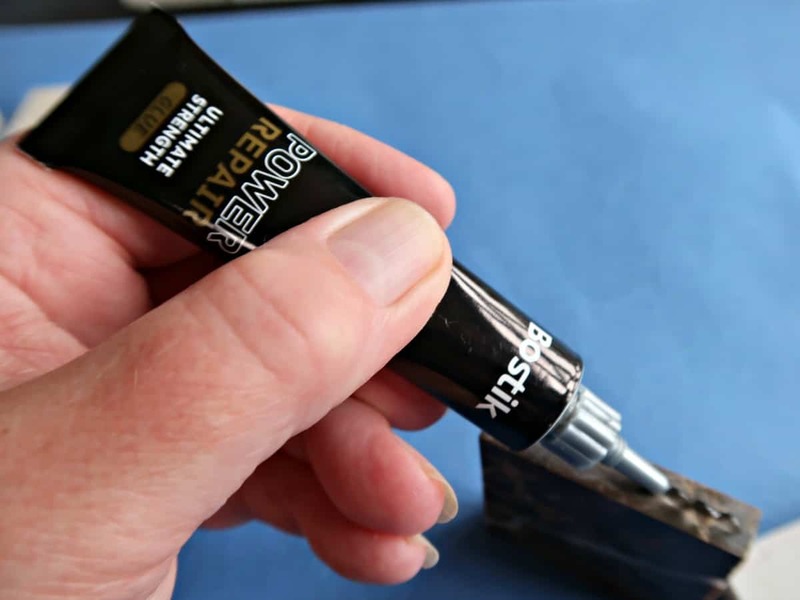 Although you only have to hold the two surfaces you are gluing together for ten seconds after application, it is still re-positional for three minutes allowing plenty of time for any minor adjustments. Best of all it won’t stick your fingers together and doesn’t require clamping to form a super strong bond. My tiles came as a sheet, so I started by removing them from the backing. They pulled off easily, and the residue glue left washed off in warm water. 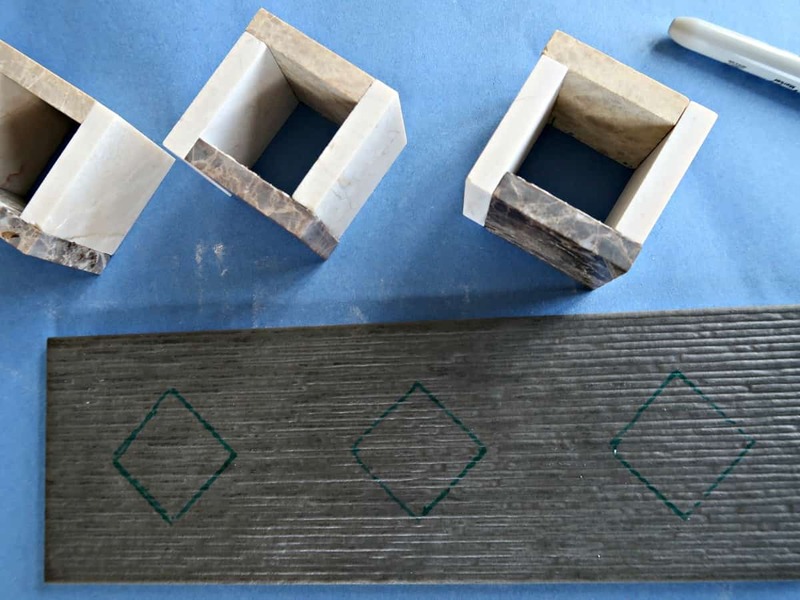 The tiles I chose to make my square pots were 5cm square and 1cm thick. They are lovely little tiles made from marble. I was able to buy an individual sheet of square tiles and the single base tile for just a few pounds, so if you don’t have any leftover from another project, they are cheap to buy. TIP: If you are looking to buy a sheet of tiles for crafts it is always worth asking if they have any broken ones that they can do a deal on, as they often do. The ceramic tiles stuck together really easily using the Bostik Power Repair glue. It comes with a choice of a small or large nozzle, and I used the small. 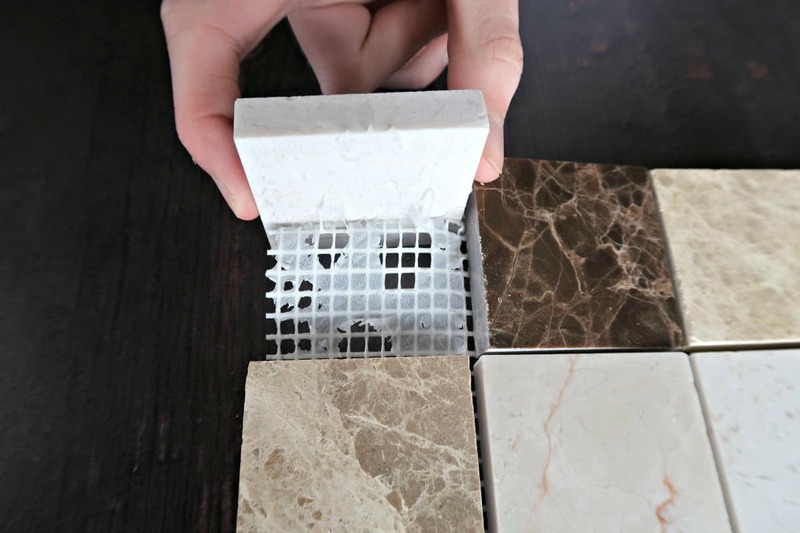 Since this adhesive is re-positional for 3 minutes you can get all four sides in place, then make any adjustments you need to make a perfect cube. Once I had made the three cubes out of tiles, I left them to dry for about two hours. The Bostik Power Repair glue will fully set in this time and achieves full strength after 24 hours. 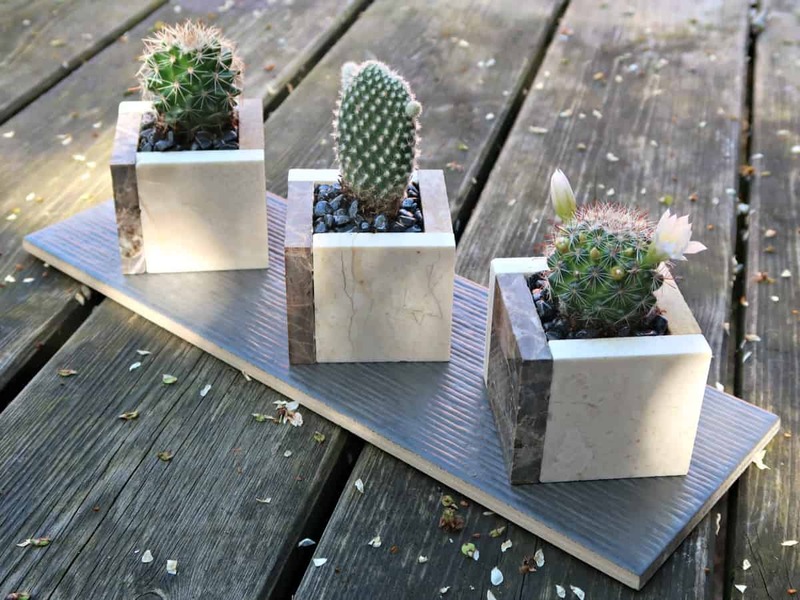 It is the perfect choice for making these planters as the glue used needs to be both strong and waterproof. If you look at the cubes, you can see that they end up larger than the individual tiles. This means that you can’t just use a fifth one to make a base and turn it into a little pot. My solution was to stick my square planters onto a base tile to create a window sill planter. I positioned the three square pots on the base tile by eye. Once I was happy with the spacing I used a sharpie to mark out the inside of each cube to use as a guide when I stuck each one down. 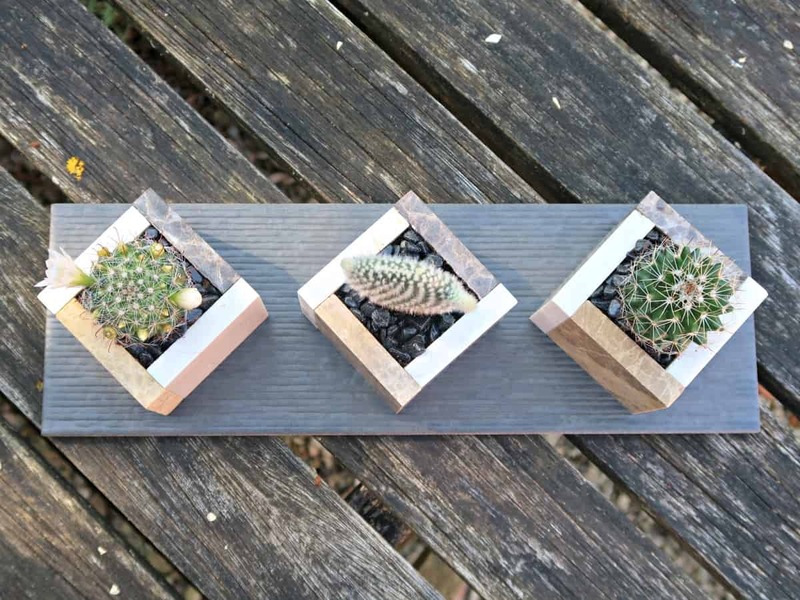 How I planted my cute square pots with mini cactus plants. Before planting my mini cactus plants, I gave them a good drink of water. This helps soften the compost around the roots making it easy to insert them into the square pots. It is always advisable to use some gravel in the bottom of pots when planting succulents and is essential when the containers are as small as they are here and with my Mini Succulents in a Tin Can. Succulents hate sitting in water and always appreciate good drainage. Due to the texture of the bottom tile which is grooved, any excess water will escape when my miniature plants are watered. The gravel will also help stop any soil washing out and making a mess on the base. 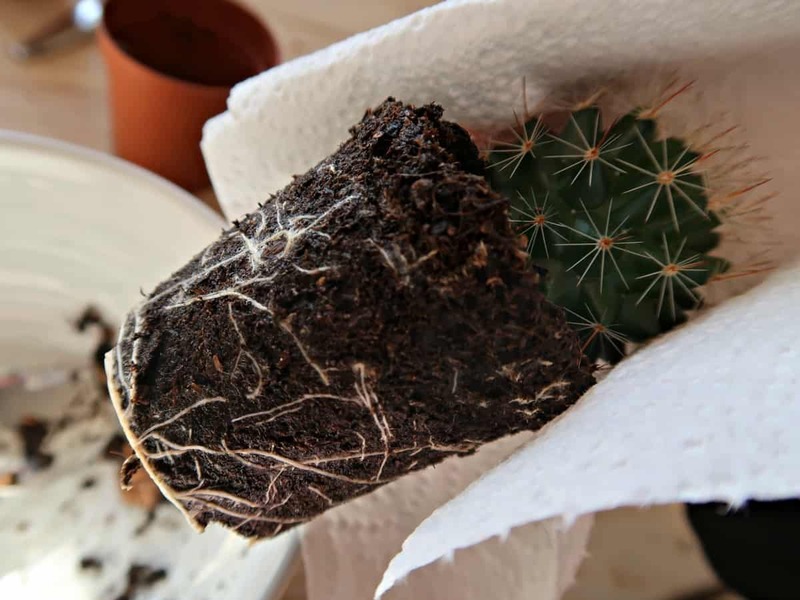 The spikes on cactus plants can be unpleasant, even on miniature plants. To avoid being pricked I tipped the plants out onto a thick piece of kitchen towel to protect my fingers. I then squeezed the compost into a cube shape before placing them into their new square pots. 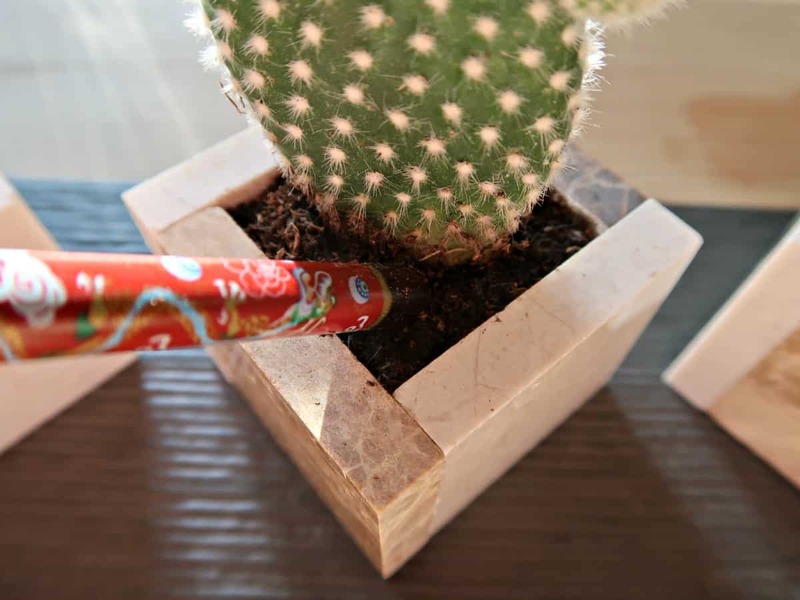 A chopstick proved useful to push the miniature plants down into place and to firm the soil around them. I added a layer of decorative gravel on top as a finishing touch. 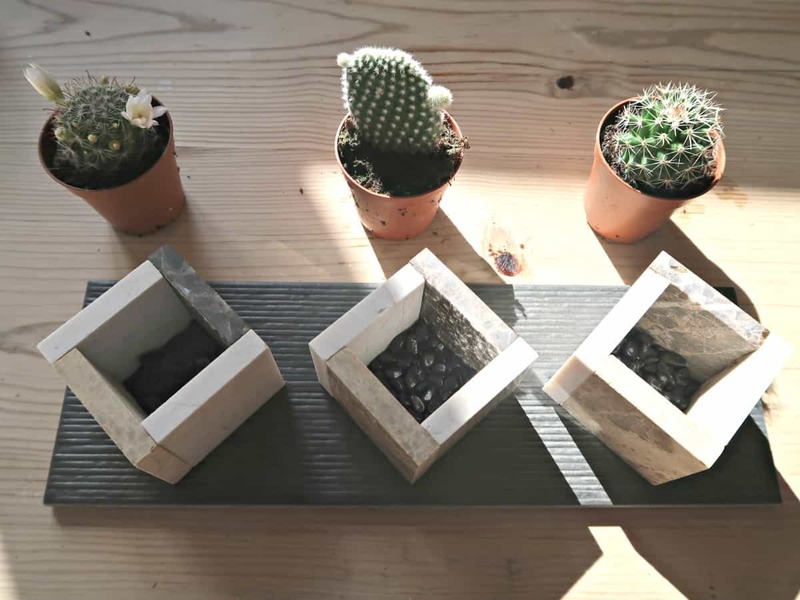 Our mini cactus planter looks really stylish planted up and fits perfectly on our window sills. All succulents love lots of light so they should thrive positioned in a window. And due to the weight of the tiles, even our mischievous cat won’t be able to knock our tile planter off. For more imaginative ways to display your houseplants check out our Air Plant and Wire Jellyfish and our Birch Bark Covered Flowerpots. And if you are looking for some original outdoor succulent planter ideas, start with our gorgeous Succulent, Moss and Chicken Wire Toadstool and our Garden Art Made From Colourful Succulents.